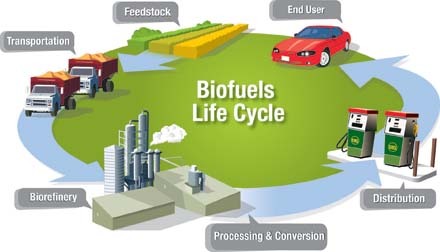 Explore life cycle analysis to understand how biodiesel impacts the environment. Life cycle analysis is a relatively recent tool, growing in popularity, that is used to estimate the environmental, energy and economic performance of a product or a system. In essence, it is a budgeting process that accounts for all inputs — raw materials and energy — and outputs — products, waste materials and environmental impacting components such as CO2. Environmental life cycle analysis (EvLCA) is similar to energy life cycle analysis (EgLCA), except that the accounting is conducted for pollutants rather than energy. One of the frequently measured parameters in EvLCA is the product’s global warming potential. The first step, the goal and scope definition, is the one that separates EgLCA from EvLCA. The goal of EgLCA is to assess the renewability of a biofuel, whereas the goal of EvLCA is to measure the environmental benefits from making a biofuel. In the case of biodiesel and ethanol, the objective of EvLCA is mainly to assess the reduction in global warming potential of the fuel compared to a petroleum baseline fuel like diesel and gasoline. In the United States, the Energy Independent and Security Act of 2007 (EISA (2007)) has mandated the use of 36 billion gallons of renewable fuel by 2022. This 36 billion gallons of biofuel is made up of 21 billion gallons of advanced biofuels, including 16 billion gallons of cellulosic ethanol. The Energy Independence and Security Act of 2007 set the first-ever mandatory life cycle greenhouse gas (GHG) reduction thresholds for renewable fuel categories. To be classified as an advanced biofuel, a renewable diesel fuel must reduce greenhouse gas emissions by 50 percent compared to petroleum diesel, and cellulosic ethanol must reduce greenhouse gas emissions by 60 percent compared to gasoline. Soybean fields in Michigan. Photo: Dwight Burdette; Wikimedia Commons. 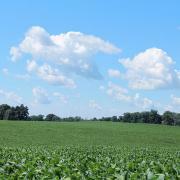 The report found that the net CO2 reduction from the use of soybean-based biodiesel was 78.45 percent. The report included all the direct inputs to biodiesel production, from soybean agriculture to final use of biodiesel. However, this report did not include an estimate of carbon emissions from indirect land use change (ILUC). EISA 2007 mandates the inclusion of carbon emissions from indirect land use changes. The definition of life cycle analysis set forth in EISA 2007 includes both direct and indirect carbon emissions related to the full fuel life cycle. The Environmental Protection Agency (EPA) defined direct emissions as those that are emitted from each stage of the full fuel life cycle, and indirect emissions as those emitted from second-order effects that occur as a consequence of the full fuel life cycle. For example, direct emissions for a renewable fuel would include net emissions from growing of feedstock, transporting the feedstock to the fuel producer, producing the fuel, transporting the finished fuel to the consumer, and use of the fuel by the consumer. Similarly, direct emissions associated with the comparable petroleum-based fuel would include net emissions from extracting the crude oil, transporting the crude oil to the refinery, producing gasoline or diesel fuel from the crude oil, transporting the finished fuel to the consumer, and use of the fuel by the consumer. Indirect emissions would include other emissions impacts that result from the effects of fuel production or use, such as changes in livestock emissions resulting from changes in feedstock costs and livestock numbers, or shifts in acreage between different crop types. The definition of indirect emissions specifically includes land-use changes such as changes between forest, pasture, savannah and cropland types. ILUC is the study of the indirect and unintended consequences in carbon emissions caused by production of a biofuel feedstock. For example, if more cropland is dedicated to producing biofuel feedstocks, perhaps forestland or wetlands somewhere else in the world might then be converted to cropland. Corn in Ohio. Photo: Graylight; Wikimedia Commons. can be very difficult to decide on the cause of indirect land-use change. When a forest is converted into cropland or grazing land, is this because, somewhere else in the world, someone else is using cropland to produce biofuel feedstock? Or is it because there is a greater demand for food due to population expansion? Or is it because, as people in China and India earn more money, they are demanding more meat? Nevertheless, it is important to take possible indirect land use change into account when assessing a biofuel’s environmental life cycle. We do not want biofuel use to inadvertently cause more carbon to enter the atmosphere. The United States Environmental Protection Agency (EPA) conducted a life-cycle assessment of greenhouse gas (GHG) emissions associated with renewable fuels production as part of the revisions to the National Renewable Fuel Standard program. EISA 2007 specifies that EPA’s life-cycle analysis must take into account GHG emissions “related to the full fuel life cycle, including all stages of fuel and feedstock production and distribution,” including “direct emissions and significant indirect emissions such as significant emissions from land-use changes.” In addition, EISA 2007 requires the EPA to determine which biofuel production pathways reduce GHG emissions by the required threshold amounts relative to the 2005 petroleum baseline. The EPA’s Renewable Fuel Standards Program Regulatory Impact Analysis, released in February 2010, analyzes ethanol and biodiesel in terms of life-cycle greenhouse gas emissions. 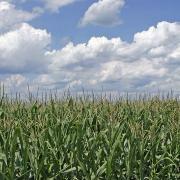 This analysis found that on average, corn ethanol produced in a plant powered by natural gas results in a 21-percent reduction of greenhouse gases compared to gasoline. Soy biodiesel results, on average, in a 57-percent reduction in greenhouse gases compared to fossil diesel, and biodiesel produced from waste grease results in an 86-percent reduction. See chapter 2.6 of this document for more detailed information. EISA. 2007. Energy security through increased production of biofuels. In Energy Independence and Security Act of 2007: One hundred tenth congress of the United States of America. EPA. 2010. Renewable Fuel Standards Program Regulatory Impact Analysis EPA-420-R-10-006 Office of Transportation and Air Quality: United States Environmental Protection Agency. Kim, H., S. Kim, and B. E. Dale. 2009. Biofuels, Land Use Change, and Greenhouse Gas Emissions: Some Unexplored Variables. Environmental Science & Technology. 43(3): 961-967. Searchinger, T., R. Heimlich, R. A. Houghton, F. X. Dong, A. Elobeid, J. Fabiosa, S. Tokgoz, D. Hayes, and T. H. Yu. 2008. Use of US croplands for biofuels increases greenhouse gases through emissions from land-use change. Science. 319(5867): 1238-1240. Attributional vs. Consequential Life Cycle Analysis of Biodiesel — A two-page summary clarifying the differences between attributional and consequential life cycle analysis. These techniques have been used to assess the greenhouse gas emissions of biodiesel. The United Nations Collaborative Programme on Reducing Emissions from Deforestation and Forest Degradation in Developing Countries (UN-REDD) — this U.N. initiative aims to offer financial incentives to developing countries to preserve forests. Roundtable on Sustainable Biofuels — an international initiative based in Switzerland,the RSB has developed a third-party certification system for biofuels sustainability standards. Sustainable Biodiesel Alliance — this Texas-based organization promotes environmental, social and economic sustainability of biodiesel. They aim to create certification for sustainability in biodiesel. Securing Foreign Oil: A Case for Including Military Operations in the Climate Change Impact of Fuels — The indirect greenhouse gas emissions resulting from military actions to protect our access to petroleum-based fuels should be included in any comparison of greenhouse gas emissions of petro-fuels and biofuels, argues this article published in the July/August 2010 issue of Environment magazine. Indonesia’s Climate Experiment — the Indonesian city of Banda Aceh is the site of the world’s first commercial project to allow a government to generate carbon credits based on protecting forests.